Caution - During the motherboard removal procedure, it is important to label power supplies with the slot numbers from which they were removed (PS0, PS1). This is required because the power supplies must be reinstalled into the slots from which they were removed; otherwise, the server key identity properties (KIP) data might be lost. When a server requires service, the KIP is used by Oracle to verify that the warranty on the server has not expired. For more information on KIP, see FRU Key Identity Properties (KIP) Automated Update. Note - Remove the M.2 SATA cable between the PCIe slot 3 riser and the motherboard SATA connector and set it aside. Remove cables from the motherboard. Disconnect the disk backplane power cable from the motherboard by pressing in on the connector latch and then pulling out the cable connector . Disconnect the disk backplane data cable by opening the ejectors and pulling out the cable connector . 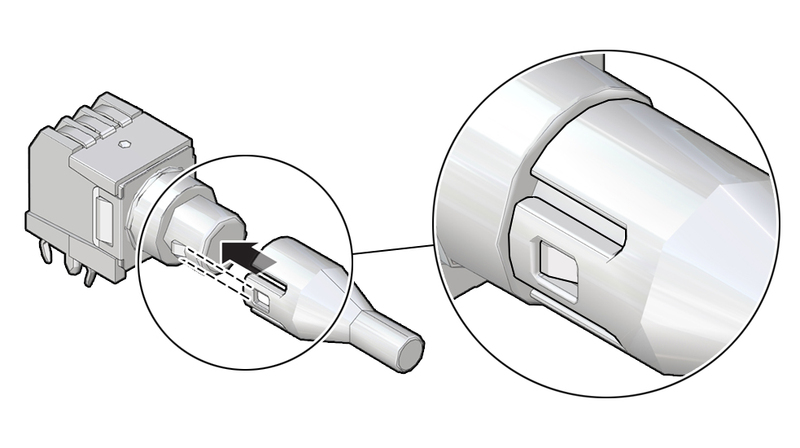 Disconnect the front indicator module (FIM) cable connector by opening the ejectors and pulling out the cable connector . Disconnect the NVMe cables (if present) and carefully lift them from the center cable trough and set them aside . Note - You do not need to remove the NVMe cables or the chassis mid-wall when removing the motherboard from the server chassis. Remove the SAS cables and the super capacitor cable that were connected to the internal HBA card, and then carefully lift them from the left-side cable trough and set them aside . Remove the motherboard from the server chassis [5, 6]. 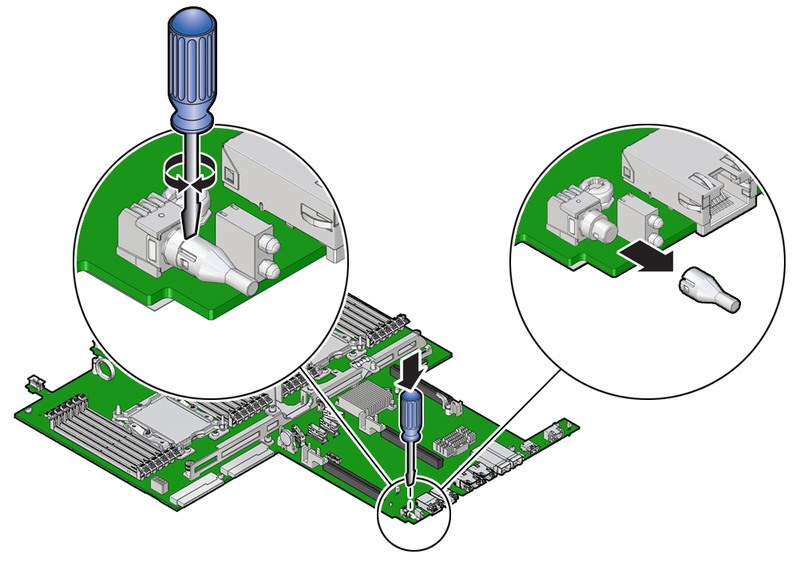 Using a Torx T25 screwdriver, loosen the two green captive screws that secure the motherboard bracket/handle to the server chassis. Grasp the metal bracket located just to the rear of the DIMM slots and the finger loop, and then slide the motherboard toward the front of the server and lift it slightly to disengage it from the eight mushroom-shaped standoffs located on the server chassis under the motherboard. Lift the motherboard out of the server chassis and place it on an antistatic mat and next to the replacement motherboard. See Servicing an Internal USB Flash Drive (CRU). See Servicing the DIMMs (CRU). Note - Install the DIMMs only in the slots (connectors) that correspond to the slots from which they were removed. Performing a one-to-one replacement of the DIMMs significantly reduces the possibility that the DIMMs will be installed in the wrong slots. If you do not reinstall the DIMMs in the same slots, server performance might suffer and some DIMMs might not be used by the server. 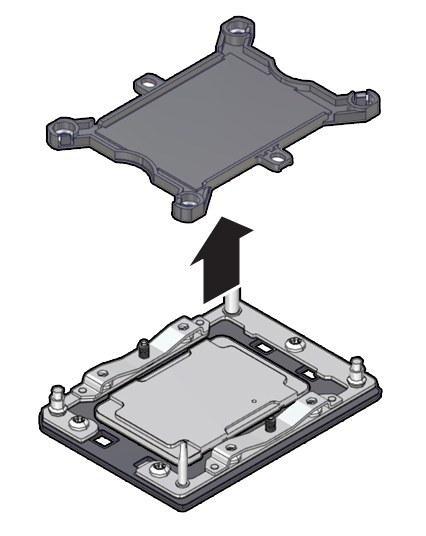 Repeat Step 7.a and Step 7.b to remove the second processor socket cover from the replacement motherboard and install the second processor. You will hear an audible click when the processor socket cover is securely attached to the processor socket. 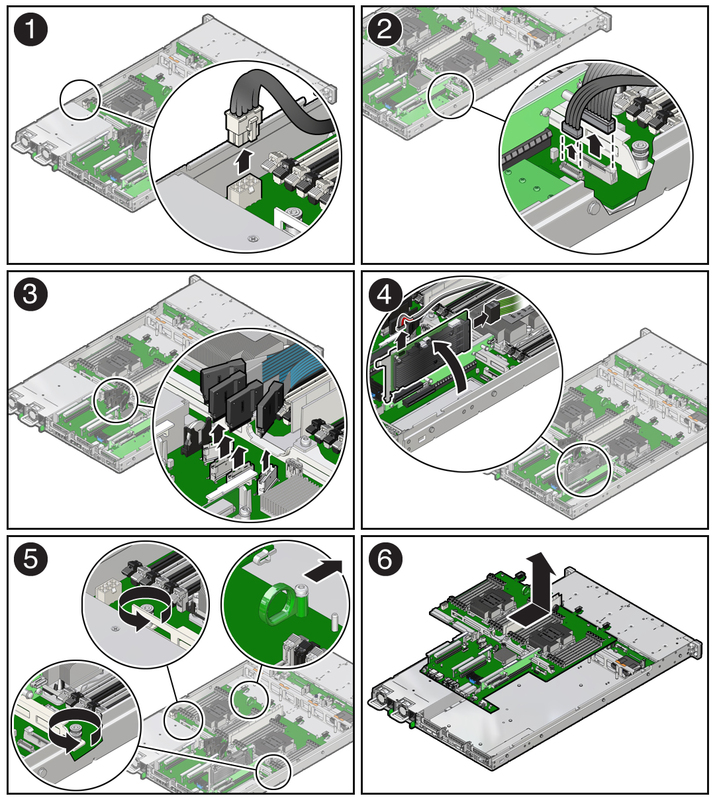 Repeat Step 8.a to install the second processor socket cover on the faulty motherboard. If you find a replacement light pipe, skip to Step 9.b.